I want to properly vet and verify PropOrNot. Other authors have spoken with the same representative for PropOrNot, they had much of the same information as I now have, and inexplicably came to a different conclusion. Here is the truth as I know it. The Washington Post article, Russian propaganda effort helped spread ‘fake news’ during election, experts say, featured PropOrNot, and I believe it was good they received publicity. 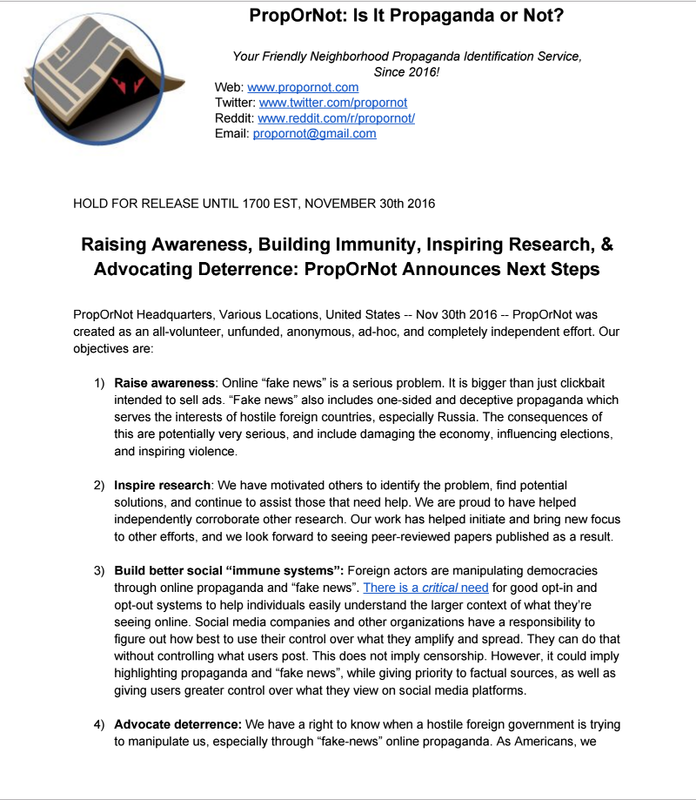 They are helping to raise awareness and this will help build support to counter Russian propaganda and fake news (and countless other Russian Information Warfare tools). For three years I’ve been carefully documenting how Russia is attacking the West, undermining our faith in our governments, in our electoral process, and in democracy itself. Then the US 2016 elections rolled around and “we the people” were subjected to an onslaught of fake news, which undermined our faith in the press. We were subjected to Russian propaganda which I believe paralleled the rhetoric of one of the candidates, who was most likely an unwitting partner. Some interpreted this as he willingly cooperated with the Russians, without a shred of evidence. We also saw the release of emails which were probably stolen by Russian hackers and handed over to Wikileaks. I also documented Russian propaganda sites and what I called Russian proxy sites in a blog: Russian News And Russian Proxy News Sites. I thought it was pretty damn cool, but I am just one person. Now it appears PropOrNot is doing the same thing, but bigger, badder, and *gasp* better. On Friday and again on Saturday evening, I spoke at length and exchanged numerous emails with an anonymous representative from PropOrNot, who explained quite a bit about the group, which is approximately 40 people. They know each other from working together, from mutual interests, friends of friends, and have a wide variety of backgrounds. They’re scattered all over the United States. Yes, they’re swamped with offers for assistance but right now they’re in a committed relationship. They’re not taking on new members and they definitely do not pay. They’re all volunteers. They are, quite literally, learning from the school of hard knocks and doing a damn fine job for rank amateurs. They are doing their best to build and maintain academic and professional rigor. Feedback and news tips are appreciated. One of the ways I’ve tracked Russian propaganda through the years is to track certain unique phrases the Russian propagandists use in specific articles. Tonight I was tracking a story on a known Russian-proxy propaganda dissemination site, YourNewsWire.com. My definition of a Russian propaganda site is that the site must contain at least 20% Russian propaganda, the rest is fluff, filler or “cover” – to make the site appear legitimate. I don’t care what the fluff looks like as much as that 20% propaganda. The story I was tracking was “Obama To Sign Bill Making ‘Alternative Media’ Illegal“. In the story, the phrase “measures by Russia to exert covert influence” appears, already in quotation marks. I plugged that phrase into Google to see where else it appeared. Reuters published this (I added the emphasis), which appears to be the original: “The top U.S. intelligence officer has asked Congress to drop a provision in a pending bill that would create a special committee to combat Russian efforts to exert covert influence abroad, saying such a panel would duplicate current work and hinder cooperation with foreign allies.” Source: http://www.reuters.com/article/us-usa-intelligencwe-russia-idUSKBN13R2GB. Please notice two different directions taken by these articles, the original story in Reuters says the effort is stopping, the propaganda story in YourNewsWire says the effort is continuing. If there is any doubt that GlobalResearch.ca is a Russian fake news site, here is their version: “When Truth-Telling Becomes Russian Propaganda“. This is one of the many ways that Russian propaganda works, because most Americans do not check if a story is real. I saw the phrase on RT, where it most likely began, and was then spread through a network of other Russian and Russian proxy propaganda sites. PropOrNot has an automated tool, called a script, that does the same thing. It “scrapes” various websites, noting the title, the URL and other particulars. Then members of PropOrNot use a nine-section form to drill down on which sites qualify as a propaganda site or not. Then, and only then, is a site added to the list of fake news and propaganda offenders. They have a much better system than I do. What takes me from 10 to 30 minutes for a short list, they can review a whole network of dozens in seconds, then document their findings, with an organized system. They are working to improve all of it. In light of the recent hyper-scrutiny of PropOrNot, the group is internally discussing the standards by which they judge sites. A few of their judgment calls are being contested, and they are treating this as a learning experience. I asked them to post their standards by which they judge sites. They are discussing posting their standards now and I bet they will. 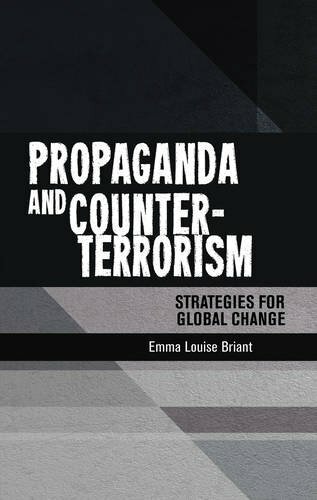 …the Post’s story had the force of revelation, thanks in large part to the apparent scientific authority of PropOrNot’s work: the group released a thirty-two-page report detailing its methodology, and named names with its list of two hundred suspect news outlets. The organization’s anonymity, which a spokesperson maintained was due to fear of Russian hackers, added a cybersexy mystique. Adrian and Eliot, they are amateurs. They are volunteers and readily admit this. Nobody makes a brand new product perfectly from the beginning. Call it a prototype, if you will. I predict that soon their product will be the gold standard for the identification and posting of fake news and propaganda sites. In these goals, PropOrNot and I are completely aligned. Anonymity, it’s a good thing. The man I spoke with is youngish, articulate and very intelligent. He did not tell me his name, and I never asked. He revealed the group is discussing one person being named. I asked if it would a real name or a pseudonym, he switched the subject. I believe people who do what PropOrNot does should have the right to anonymity. I have a ton of haters, I’ve received death threats (bring it, B), and a bunch of hit-pieces were published about me. But I’m ex-Special Forces. PropOrNot, these new protectors of truth, justice and the American way, choose not to have to deal with the low-life trolls of society. So they go to great lengths to remain anonymous. The representative used the word Opsec, so they know quite a bit about information discipline. At least one of the members is former military. They are more professional in this regard than some politicians we all know. Okay, one politician. To talk with the PropOrNot representative, I had to install a new encryption app on my phone. Yes, they are very serious about protecting themselves. On Wednesday, November 30th, PropOrNot released a statement which more fully explains many of the points I have touched on in this blog. I have attached it here: propornot-nov-30-press-release. I list many of the denigrating articles of PropOrNot below, to read at your leisure. Bottom line near the bottom. PropOrNot is real, they are flesh and blood and brains. They are doing the best they can to protect you and me from information intended to poison our brains and hurt America and the West. I trust them and I do not say that easily or often. PropOrNot is legitimate , they have my seal of approval.